Empowering the soul, granting a sense of clarity, kindling connectedness and serving as an excellent detoxifier to purify one from physical and emotional mayhems and toxins is all that Cedarwood essential oil does to mankind. Extracted from the woods of the Cedar tree by steam distillation process, Cedarwood essential oil stands unique with extensive healing benefits ranging from acne to ulcers. Derived from the Sanskrit word, Devadaru meaning the woods of Gods, Cedarwood tree and its essential oil is a divine cure for numerous ailments like bronchitis, cough, cold, dandruff, insomnia, osteoarthritis and cancerous tumors. 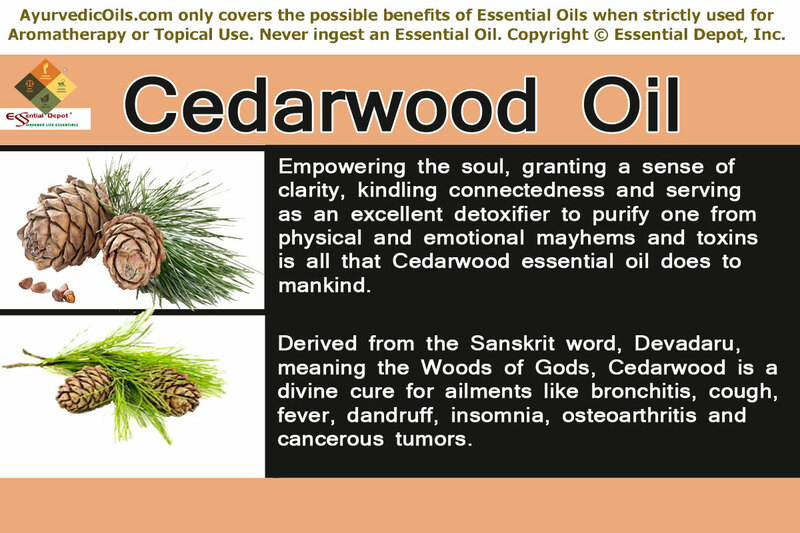 Known to the world as an effective stress buster, Cedarwood essential oil is used in various Traditional and Alternative medicinal practices including Ayurveda, where this miraculous tree and its therapeutic essential oil are used to treat diarrhea, headache, fever, urinary infections, flatulence, hemorrhoids, arthritis, and congestion. Botanically called as Cedrus Deodara, Cedarwood trees own the accolade of religious significance in Hinduism and Christianity. Highly preferred by the Indian sages as the perfect living place, this tree was used in building numerous places of worship including King Solomon’s temple. The serene fragrance of Cedarwood trees kindle the spiritual feeling and bring one closer to God through prayer. Owing its resemblance to the Arabic word ‘Kedron’ meaning ‘power’, Cedarwood tree empowers us mentally. It was well known to the ancient Egyptians, Sumerians and Tibetans for its use as a preservative for embalming the mummies, to keep away from infections and insects, and in the manufacturing of cosmetics and incense sticks. Native Americans used Cedarwood essential oil to enhance them spiritually. It was traditionally believed by the Chrokee that the presence of a small piece of Cedarwood tied in a medicine tag and worn around the neck would build a protective shield against illnesses and results in quicker recovery. Ancient Europeans made use of Cedarwood in curing flatulence, indigestion, plague, fever, small pox and leprosy. American Indians held Cedarwood as a remedy for many health conditions like rheumatism, headache, fever, constipation and also as an analgesic. Traditional Indians followed the culture of building rooms with Cedarwood for storing food grains and meat for protecting from the advent of microbes and insects. The bark of Cedarwood tree helps in fighting against fever, diarrhea, dysentery and ulcer. It also serves as an effective astringent and works out wonders in reducing the sugar level in the body. The insecticidal activity of its essential oil is used to repel insects in cattle, camels and horses. This oil is well known for its wide application in France in the treatment of urinary infections, cellulites, water retention, hair loss, to control anger and nervous tension. The intricate aroma of the woods of this tree have a astounding healing attribute that the Indians used to just sit under this tree to alleviate the symptoms of asthma and respiratory disorders. This amazing tree adds one more feather to its cap by being crowned as the national tree of Pakistan. With the highest amount of sesquiterpenes, a hydrocarbon group Cedarwood essential oil owes it unique odour to alpha and beta cedrenes and cedrol. It also contains thujopsene, himachalenes, pentane, acetonitrile, atlantone, humulene and other sesquiterpenes. The therapeutic properties of Cedarwood essential oil includes anti-infectious, antibacterial, antifungal, astringent, circulatory, antioxidant, antiseptic, stimulant, diuretic, sedative, expectorant and insect repellent. The oldest medicinal system on earth aging more than 5,000 years is none other than Ayurveda, which means the ‘knowledge of life’. It is the only oldest science that has been documented in a systematic manner and the first writings on Ayurvedic medications were a part of Atharvaveda, one among the 4 Vedas or sacred books of the Hindu Mythology. Ayurveda has its origin in India and is a priceless gift to mankind by the ancient saints and sages. The most important Ayurvedic encyclopedias that talk about almost all the diseases on earth and its Ayurvedic healing remedies are Charaka Samhita by Acharya Charaka (Father of Medicine), Sushruta Samhita by Acharya Sushruta (Father of Surgery) and Ashtanga Hridaya Samhita (Based on Charaka Samhita + Sushruta Samhita). Ayurveda defines health as a threefold structure that revolves around the health of the mind, body and spirit. The Sutrasthana of Charaka Samhita states this as “The three – body, psyche, and soul – act as a tripod. The world stands upon them, and within them, the world abides.” Ayurveda is a holistic healing methodology that focuses on the overall well-being of an individual instead of curing the illness alone. The brilliance of Ayurveda lies in treating the root cause of a disease instead of its symptoms, which is often practiced in Allopathy or the modern medicine. This practice assists in preventing illnesses in the future, helping to grow old in a healthy manner and attain longevity or expanded life span. Ayurveda claims that every individual on earth is unique with a unique individual constitution or physical, mental and spiritual makeover. This constitution is an arrangement of three biological energies known as doshas, namely vata, pitta and kapha. Each of these doshas is a combination of the five vital elements of nature which is present in all the things on earth on a specific proportion. Vata is a blend of air and space and is responsible for the functions of the nervous system respiratory system and the circulatory system. Pitta is a grouping of fire and water and is accountable for metabolic functions and body temperature. Kapha is a combination of earth and water and is in charge for the physical structure, resilience and movement of fluids in the system. All human beings have a predominance of any one of these doshas, determining our personality, character and behavior. The natural ratio of doshas present in every person is known as Prakriti. Balance between these doshas according to the Prakriti indicates health, and imbalance to due food and other lifestyle changes causes sickness. Ayurvedic remedies aim at striking balance between these doshas and the most predominant natural remedies prescribed in Ayurvedic treatment are herbs, essential oils, Ayurvedic routine, Ayurvedic massaging, prayers, Pranayama, Panchakarma (detox therapies) and meditation. Cedarwood essential oil has the power to pacify the mind with its sedative properties. In modern Aromatherapy, this oil is often recommended for those who suffer from insomnia, stress, tension, depression, fear and anxiety, for it stimulates the secretion of serotonin that is converted into melatonin in the brain. Melatonin plays a major role in calming down the nerves and soothing the muscles, which leads to a peaceful and unwavering sleep that holds numerous virtues to our health such as preventing one from getting into obesity and various other risk factors such as cardiovascular diseases and hypertension. It poses a state of tranquility to the spirit and relaxes the nerves, relieving you from anxiety and promoting the feeling of self acceptance thus making you feel more secure. Cedarwood oil enhances your spiritual feelings and induces the state of meditation bringing you closer to the divine power and makes you feel stronger from within. It is for this reason that the Indian sages preferred the forest filled with Cedarwood trees as their favorite place to meditate. Mix 2 drops of Cedarwood oil with 2 drops of Petitgrain oil, which is known as emotionally harmonizing oil in your diffuser before going to bed or during the time of meditation or while performing Pranayama (the art of balanced breathing) for enriching your divine thoughts and invigorating your connectivity with the heavenly power. You can also opt for an Ayurvedic massage with 5 drops of Cedarwood oil mixed with 5 drops of Ylang Ylang oil in 5 ml of olive oil for uplifting your senses and relaxing your system. With the Oxygen Radical Absorbance Capacity (ORAC) value as 169,000 µTE/100g, Cedarwood essential oil acts as a natural antioxidant to quench the free radicals. It reduces the aging symptoms and proves good for problems related to the skin and hair due to aging. Trusted scientific researchers have proved the efficacy of Cedarwood essential oil in treating Alopecia Areata, a condition associated with loss of hair from any part of the body most frequently identified in the scalp. A 1998 study published in the Archives of Dermatology states that 44% of the people with Alopecia Areata treated with essential oil mixture which includes Cedarwood oil showed improvement with ease and without any side effects, when compared to the other group treated with carrier oils. The presence of nortracheloginin, dibenzylbutyrolacto lignanan and matairesinol enhance the antioxidant attribute of Cedarwood essential oil that effectively protects the cells from damage and rejuvenates the formation of new cells. From time immemorial, Cedarwood oil has been used for its beneficial effects on hair growth and in the prevention of dandruff, scalp irritation and other problems associated with hair and scalp. It remains as an important natural ingredient in hair care products as it promotes hair growth and curbs dandruff with its antifungal properties. Blend 3 drops of Cedarwood oil with 3 drops of Jatamansi oil in 5 ml of coconut oil massaged to your scalp can help in promoting natural hair growth, controlling loss of hair and reducing dandruff gradually. Insects, especially mosquitoes often serve as the carrier for certain hazardous diseases such as malaria, dengue etc. Cedarwood essential oil is naturally rich in sesquiterpenes such as atlantones and himachalenes, making it an excellent insect repellent that sanitizes the surrounding. A 2011 research article published in PubMed states that Cedarwood essential oil is best used in pest management for its Larvicidal effect on diamondback moth, Plutella xylostella, L which are the dangerous pests of the cruciferous crops. 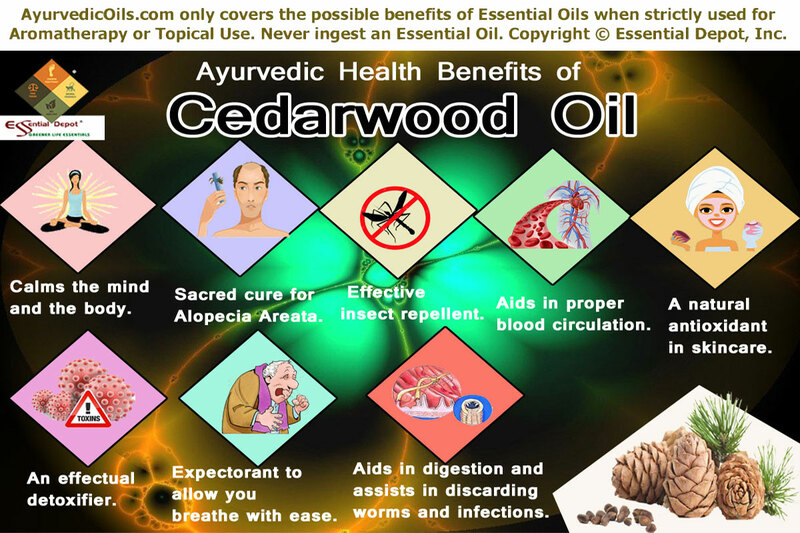 Amidst the other insecticides and pesticides that are chemically unsafe, Cedarwood essential oil serves as a natural remedy to drive away various insects including moths and ants. It is for this reason the woods of the Cedarwood tree were used in building wardrobes, store rooms for conserving food items and pet houses for cats and dogs to drive away fleas. Cedarwood essential oil can be called as a harmonizing insect repellent that kills insects and fills the atmosphere with its elevating woody aroma. Certain sources state that a mixture of Cedarwood essential oil along with that of Sage oil, Juniper berry oil, Rosemary oil, Lavender oil and Cinnamon oil hold the potential of repelling brown treesnakes (Boiga irregularis) subjecting them to a sudden undirected movement diverting away from their path. Cedarwood essential oil was also tested effective against the larvae of the mosquito species Aedes aegypti, Anopheles stephensi and Culex quinquefasciatus, which are the vectors of the dreadful ailments that include yellow fever and chikungunya. It served as an eminent pesticide targeting the mosquitoes that breed in water and inducing 100% mortality even in the third-instar larvae stage of these species. 2 drops of Cedarwood oil mixed with 2 drops of Lavender oil can be mixed with 2 ml of Jojoba oil can be applied on the skin for keeping away from the harmful insect bites and stings. Bearing close functional resemblance to that of the hemoglobin content present in blood, the sesquiterpenes in Cedarwood essential oil oxygenates the human body at the cellular level and promotes the release of toxins and aids in proper circulation supplying oxygen and nutrients to various parts of the body. Just inhaling the fumes of the Cedarwood essential oil shows drastic changes in the behavioral patterns of human beings. As per a 2003 research, the chemical constituent Cedrol in Cedarwood oil showed a significant reduction in the heart rate, rate of respiration and blood pressure in humans who were exposed to the fumes of Cedarwood essential oil. 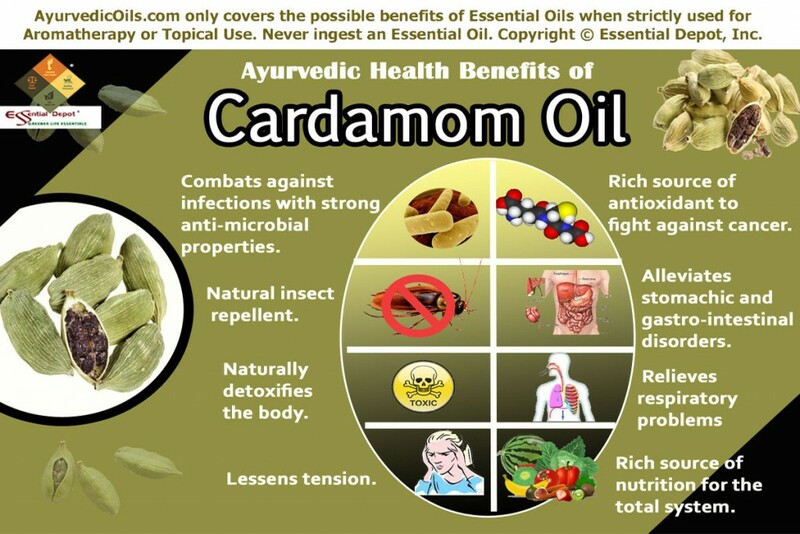 It acts as a defensive warrior against cardiovascular diseases and other ailments associated with poor circulation. 5 drops of Cedarwood oil with 5 drops of Vetiver oil (excellent oil in promoting blood circulation, fortifying the red blood cells and promoting the supply of oxygen to the cells) mixed with 5 ml of sesame oil can be used in massaging your system for regularizing proper blood circulation. This can be followed by a warm bath diluted with 2 drops of Cedarwood oil and 2 drops of Vetiver oil. Rich in antioxidants, Cedarwood essential oil is also a wonderful antiseptic and astringent and is widely employed in skin care for a handful of skin benefits. It tightens the cells and tissues and tones the skin in addition to cleansing it. As a sedative, it relaxes the tissues and provides relief from irritation and itching due to acne, boils and scars. It serves as an excellent remedy for various skin disorders such as psoriasis, eczema, acne, chicken pox, cracked and oily skin. With its anti-seborrhoeic attribute, it controls and regulates the secretion of sebum which is responsible for the production of acne and a medical condition associated with peeling of the skin from eyebrows, scalp etc. Cedarwood essential oil is utilized in various cosmetics and hair care products for its balancing effect on the dry and oily skin. It repels the insects effectively and helps in recovering from insect bites where it works in extracting the toxins injected by the insects from the human body. Cedarwood essential oil prevents the wounds from becoming septic by curbing the advent of harmful microbes by inhibiting their growth and protects the skin from internal and external infections by draining out the toxins. The antioxidant quality of this oil is attributed to the chemical compounds such as Benzylbutyrolactol, Matairesinol and wikstromal. Cedarwood essential oil possesses excellent apoptotic and cytotoxic attribute inhibiting the growth of tumors and preventing the multiplication of human cancer cells . 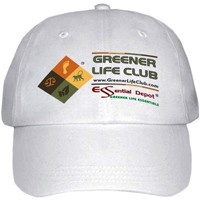 It hunts for the free radicals that induces formation of cancerous tumors and resolves the problem from the baseline. Moreover it increases the generation of nitric oxide and kills the cancerous cells by decreasing the potential of the mitochondria. 2 drops of Cedarwood oil mixed with 1 ml of Almond oil or your mild skin care cream or lotion can be massaged gently on your skin for enhancing the natural glow of your skin, reducing the growth of free radicals responsible for wrinkles and other aging symptoms. Toxins generally ruin the routine pattern of the organ functionalities in the body. Cedarwood essential oil serves as a natural diuretic boosted up with sedative properties. As an anti-seborrhoeic agent, it organizes the sebum production and other secretions from the endocrine system and promotes sweating which is one natural way of getting rid of toxins. It helps in reducing the workload of the heart by releasing the fluids with toxins found in its surrounding. 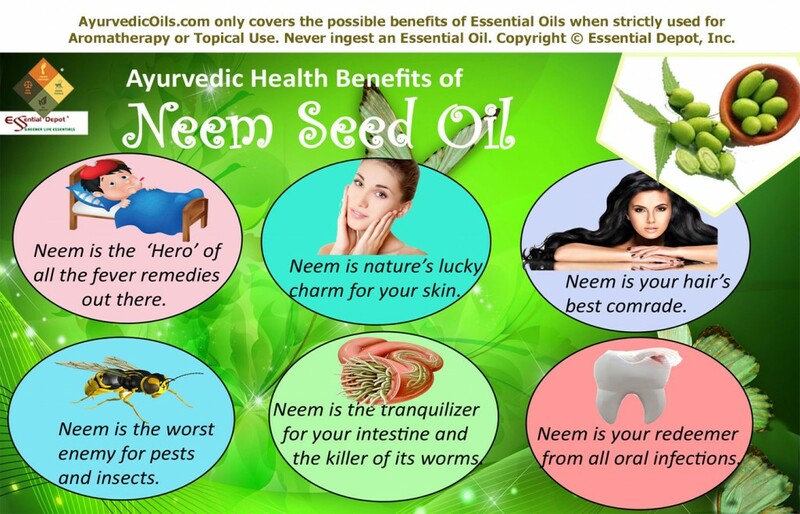 This oil also helps in getting rid of excess water, fats and uric acid from the body in the form of urine. A relief from water retention and uric acid may also relieve you from inflammations helping to recover from arthritis and rheumatism. Moreover, Cedarwood essential oil stabilizes the membrane as an anti inflammatory agent and inhibits edema and joint pain. The stable components of Cedarwood oil aided in the degranulation of the isolated peritoneal mast cells and inhibited leukotriens and lipoxygenase in rats with paw edema induced by carageenin. It helps in maintaining the health of the liver, by helping it to encounter with less toxins. With regulated excretion of water from the body in the form of sweat and urine, this oil helps in maintaining a healthy cholesterol level and blood pressure and aids in overcoming from the harmful effects of water retention such as obesity and hypertension. It also aids in proper functioning of the kidneys and the urinary system by assisting in the expulsion of unwanted fluids from the system. With its antibacterial and anti-fungal properties it helps in alleviating urinary tract infections and is used in the preparation of antiseptic and antibacterial ointments and solutions. Massaging your body with 6 drops of Cedarwood oil, 6 drops of Calamus oil and 6 drops of Clary Sage oil with 10 ml of coconut oil is an excellent way to emancipate toxic substances and water retention from the body, reduce inflammation and pain related to arthritis and rheumatism. Cedarwood oil highly benefits the respiratory system by being a natural expectorant. It serves as a remedy for all bronchial ailments. It aids in draining out the excess mucus and phlegm resulting in smooth respiration with ease and comfort. These reasons gained popularity for the use of Cedarwood oil in steam inhalation therapy for treating asthma, lung irritation and bronchitis. Add 1 drop of Cedarwood oil and 1 drop of Davana oil (relieves congestion, aids in expelling heavy deposits of phlegm and mucus in the respiratory tract and nasal) in steam inhalation and gently rubbing your throat, chest and back with 2 drops of Cedarwood oil mixed with vaporub can acts as an effective decongestant to treat cough, cold and headache associated with it. This oil clears out the congestion associated with bronchitis, sinusitis, cough, flu and cold. With its easing, nervine, diuretic and stimulant properties, Cedarwood essential oil enhances the process of digestion by stimulating the secretion of enzymes and digestive acids and bile from the liver. It relaxes the nerves and soothes the intestines and aids in the removal of gas and other waste materials from the body thus alleviating flatulence and constipation. It cures diarrhea by tightening and contracting the muscles of the intestines. The antibacterial attribute of this oil fights best against bacteria such as Listeria monocytogens that are found in food. This along with the antifungal and insecticidal property makes Cedarwood oil to protect the stomach from the advent of intestinal worms and parasites. It also helps in preserving the food items. Massaging your abdomen with 2 drops of Cedarwood oil and 2 drops of Calamus oil mixed with 2 ml of sesame oil can help in alleviating excess gas, toxic substances, worms and other infestations in the stomach and intestines. Cedarwood oil possesses emmenagogue properties and aids in womanly concerns helping in regulating the menstrual cycle by opening up blocked menstruation and it strengthens the uterus. It acts as an excellent health tonic suitable for all. 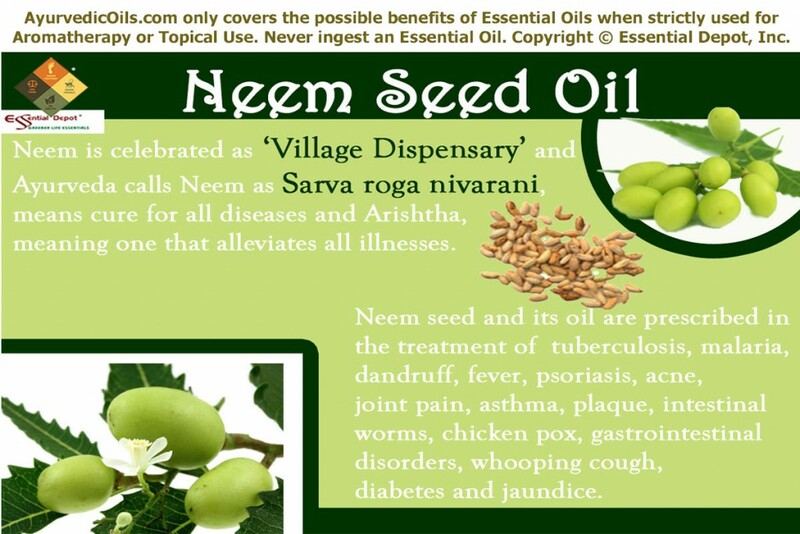 It serves as an Ayurvedic medicine to treat arthritis, restlessness and nervous breakdown. It is widely used in the manufacturing of perfumes, disinfectant cleaners, sprays, aftershaves, cleaning oil, panel closets, cigar boxes and insecticides. This article is only for the purpose of information and education and is not meant to treat, prevent or diagnose any health condition or substitute any prescribed medicines or professional medical advice. We are not medical professionals and this information is shared only with the interest of spreading the medicinal heritage of Ayurveda, the 5,000 year old healing system. Do not take essential oils internally and always remember to dilute essential oils before using it topically as pure and organic essential oils are highly concentrated substances and may tend to cause allergic reactions if used directly on the skin. 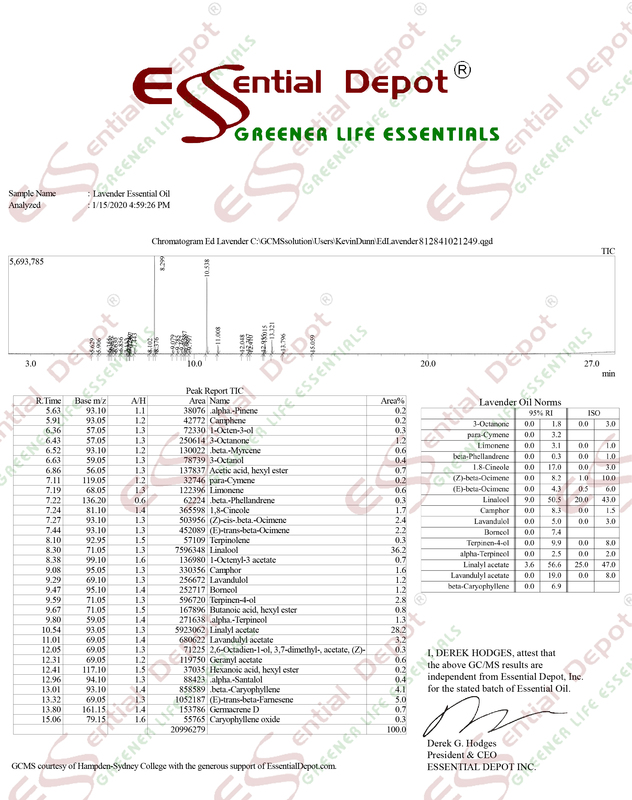 Always consult your Ayurvedic practitioner/healthcare professional before choosing the right essential oil for your state of health and unique individual constitution.